Fiction – paperback; And Other Stories; 74 pages; 2011. Translated from the Spanish by Rosalind Harvey. Review copy courtesy of the publisher. Most of us understand the phrase “down the rabbit hole” as a reference to Lewis Carroll’s Alice in Wonderland. But the only similarity between that novel and this one is the surreal nature of the journey the reader is taken on. 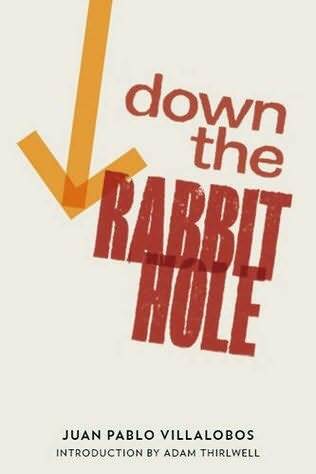 Juan Pablo Villalobos’s novella Down the Rabbit Hole was recently shortlisted for the Guardian First Book Award — and it’s easy to see why. It’s a mesmerising and powerful read about one small boy’s dream to acquire a pygmy hippopotamus from Liberia. This might sound outlandish, but seven-year-old motherless Tochtli lives a rather cossetted life in a secure compound — or “palace” as he describes it — where his drug baron father will buy him anything — toys, playthings and even a pet lion — in order to compensate for the guilt of his unusual upbringing. The story is set in Mexico, with a side trip to Liberia to look for the rather endangered you-know-what, and is told entirely from Tochtli’s perspective. Tochtli is an ordinary little boy, albeit with an advanced vocabulary — “Some of the difficult words I know are: sordid, disastrous, immaculate, pathetic and devastating” — who has an over-active imagination and loves wandering around all day in his dressing gown because he thinks it makes him look like a Samurai. But he’s also fascinated by guns, violence and death. There are actually lots of ways of making corpses, but the most common ones are with orifices. Orifices are holes you make in people so their blood comes out. Bullets from pistols make orifices and knives can make orifices too. If your blood comes out there’s a point when your heart or your liver stops working. Or your brain. And you die. His naive voice is beautifully rendered. It’s never cloying or “fake” as some child narrators are wont to be and even though he knows a lot of advanced words, he doesn’t quite understand the context in which to use them — which makes for some funny moments. Most of his narration treads a fine line between comedy and heartbreak. It works because you know that the violence Tochtli witnesses on a day-to-day basis, the bad language he hears and the puzzling behaviour of his elders that he experiences, is largely incomprehensible in one so young. For instance, he is confused by the presence of Quecholli, a woman who visits their palace two or three times a week. He doesn’t realise she is a prostitute hired by his father, but he knows there is something not quite right about her. Everything about Quecholli is a secret. She walks around the palace without looking at anyone, without making a sound, always clinging to Yolcaut. Sometimes they disappear and then reappear, really mysterious. They spend hours like that, the whole day, until Quecholli leaves. Then Miztli brings her back again and it’s back to the secrets and disappearing. Like the very best novels, this one presents an unfamiliar world that feels so real you forget that you are reading a book. And Tochtli is such a brilliant character, someone you want to protect and keep close, that it’s hard not to be affected by his situation — you understand the danger he is in, even if he doesn’t. Down the Rabbit Hole is an ultra-quick read — you can easily consume it in a couple of hours — but its brevity should not be mistaken for shallowness. This is one of the best novellas I’ve ever read. Finally, just a word about And Other Stories, the publisher of this book. This small independent press has been set up as a not-for-private-profit company and encourages its subscribers to have a say in what gets published next. If Down the Rabbit Hole is any indication of the quality of the rest of its titles then readers are in for a real treat! You can find out more via its official website. Note that its production values are very high and the books have a similar look and feel to Peirene Press’s award-winning designs. If only I could get it as an eBook: I need to read 8 books between now and Dec 31 to reach 200 for the year! My goodness!! 200 books!! That’s an amazing achievement, Lisa! I suspect if I switched off the laptop and stopped faffing around the internet and tweeting, I might make it to 100, but 200 is way out of my league. There is a Kindle version available — check on Amazon. I do like the look and feel of these books, Tony, and now knowing that the contents are just as good makes me inclined to get the whole lot in one fell swoop. Nice to hear you enjoyed Open Door… will stay tuned for your review. Think this one will go in my top 10, too, Stu.